House tastefully renovated and air conditioned. Ideal for a couple and two children. In a lauragaise farm, adjacent to another house, separated by high wooden and laurel hedges growing signs. 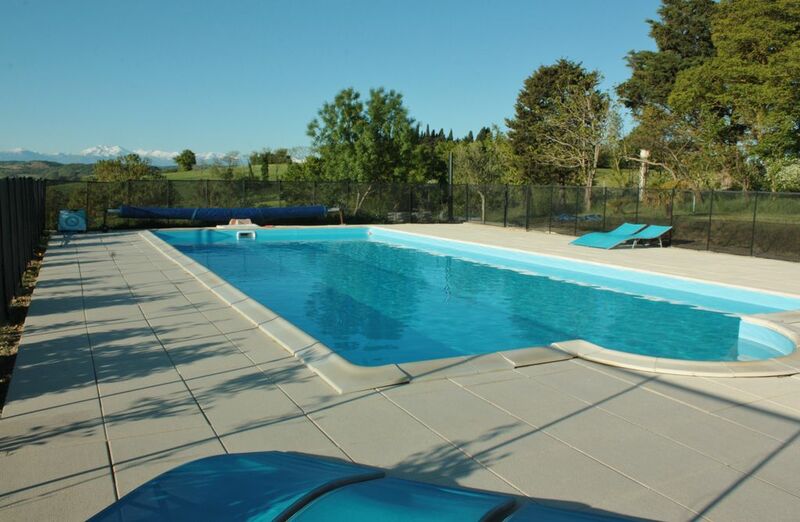 At the heart of 5 hectares of meadows with dominant view in Cathar country 15 minutes from the Canal du Midi and Castelnaudary exit on the A61. 30 minutes from Carcassonne, 15 minutes from the medieval town of Mirepoix, 40 minutes from Toulouse, 1 hour from the sea and the Pyrenees. The swimming pool of 12m, (secured by a fence standards), is paved on 150m2, which leaves each sufficient space around the pool. In addition, a semi shaded outside, provided 3 parasols and deck chairs lets you enjoy the quiet of the 180 ° view on the beautiful scenery and not overlooked! 1 open room with bed 140, storage. View private garden and Pyrenees. Screen blackout. 1 alcove with 2 closed 90 superimposed beds, a small desk and wardrobe. Large private space + arbor back and barbecue, table and chairs. • Game Spaces for children, teens and adults are arranged (trampoline, badminton, swing, soccer cages, petanque. A small wooden house for children protects various games available for quiet younger. • A driving range with target is available to adults and children (appropriate material) that wish as a package / week or one-time fee to the bucket of balls. Clubs courtesy. We welcome you with a welcome drink in the summer, and are at your disposal information on the many activities, attractions, sights of our beautiful region. Young and old will find their happiness. (Many flyers in the cottage). In summer, you have your first morning gite what you need for your breakfast if you wish. We provide bed linen and beds are made upon arrival. towels for hire: 4 € per person per week, pool towels 5 € / person / week. (Discount for longer stays). • Baskets vegetables locally, bread deposit in the village station in the morning from 8.30am to 11am from Monday to Saturday. • In July and August, relatives hypermarkets are open on Sunday morning. • 15mn from the cottage, Mirepoix and Castelnaudary, you will find many shops and services. • The races are also possible at 10km Fanjeaux where you will find a butcher, a bakery and a small grocery store. • Gruissan beach and the Pyrenees are within an hour drive. • 5 landscaped lakes are about half an hour of the cottage. (Sailing, water games for children and teenagers, pedal boats, water ski lift, etc.). Many mountain biking and hiking, water sports on nearby lakes Ganguise and swimming at Lake Monbel (700ha), with their nautical bases, supervised sports on the river Aude, (canyoning, rafting, etc.) Climbing, hydro, golf, horse riding, quad ... less than an hour. Many hikes, the Canal du Midi in discovery boat or on foot rankings heritage of humanity by UNESCO. Ice cream from sheep's milk, goat cheese and cows BIO, cassoulet, foie gras. Many surrounding farms offer tours, tastings and sales of their products. Pour le gîte LUNA, réduction de 15% si une seule chambre est occupée. (pour 2 personnes). Tarifs indiqués pour 3 à 5 personnes, soit 2 chambres occupées.